Tom Huddlestone has fond memories of previous Forest games. Tom Huddlestone says he's relishing renewing old rivalries with Nottingham Forest tonight as the Reds visit Pride Park. Both sides are vying for the top places in the Sky Bet Championship and a win for either would provide a huge psychological boost going into the Christmas period. And Huddlestone knows it will be a passionate encounter. Huddlestone has strong links to Nottingham having been born there and come through the Forest academy as a child, although it was at Derby where he made his name after being thrown in for his debut as a 16-year-old against his home town club in 2003. 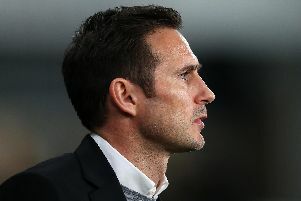 He said: "Everyone knows the general rivalry but on a personal level, being born and raised in Nottingham, my family and friends are Nottingham Forest fans, and looking back now, being let go as a kid makes for a good mix. “I was at Forest from under 9s until under 12s so I had four seasons there and then I was let go. At the time it was devastating, being a 12-year-old and told you're not quite good enough, and then a few weeks later I came to Derby at under 13s. I kicked on quickly after that. “I remember my debut well. I started right midfield and Lee Holmes got knocked out in the first 15 minutes and I ended up on the left. “It was a hot day and I think we could have nicked it late in the game with Michael Johnson hitting the crossbar."